If my BFF were to harvest and sell the kumquats from her tree, she would easily make a few hundred dollars. After all, a small basket of kumquats can sell in the store for $4-5. Her tree almost reaches her second story roof line of her house. She doesn't use them at all. In fact, I think I'm the only one who ever picks and uses them. This year I've made candied kumquats because I have been really interested in using them in a pie somehow. Tune in later this week for the great pie I created. But first, I had to make the first component- the candied kumquats. I wanted to do something different from others out there and so I tossed in some vanilla and ginger. Use the candied kumquats for desserts, over breakfast goods like waffles or French toast, and as a side item for cheese platters and other dishes. The kumquats have seeds and so I like to slice them in rounds so I can get as many seeds out as possible. Place all ingredients into a medium pot and heat on medium until the liquid begins to bubble. Turn down to low and then continue to simmer for 10 minutes. 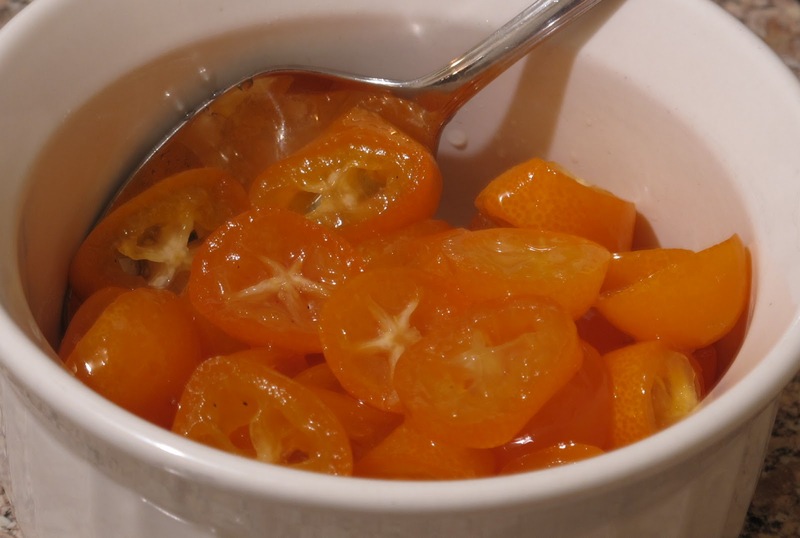 Using a slotted spoon, ladle out and drain the kumquats leaving the liquid to continue simmering down for another 5 minutes. Spoon kumquats into prepared jars to the top, but don't compact them. Ladle in the hot syrup leaving a 1/4 at the top. Seal with prepared lids. Reserve extra syrup for other projects, such as Candied Kumquat Passion Fruit Chiffon Pie.